The 10 secondary school pupils from Bushey Meads school arrived at the Training Ground to sample some of the brand new Double Club Ambassadors activities – which focuses on the many skills developed through language learning, such as communication, confidence, problem solving and leadership – all through the context of football and coaching. This prepared them for what was to follow. Pupils from 5 Hertsmere schools joined later in the morning to tackle some language activities in Spanish or French, supported and mentored by the secondary Ambassadors. The primary school pupils then took part in an inter-school football tournament that was refereed entirely in German, giving pupils their first exposure to the language in a fun environment. The language activities and football tournament contributed to an overall points table for the day, which was won by Saffron Green school in Borehamwood. 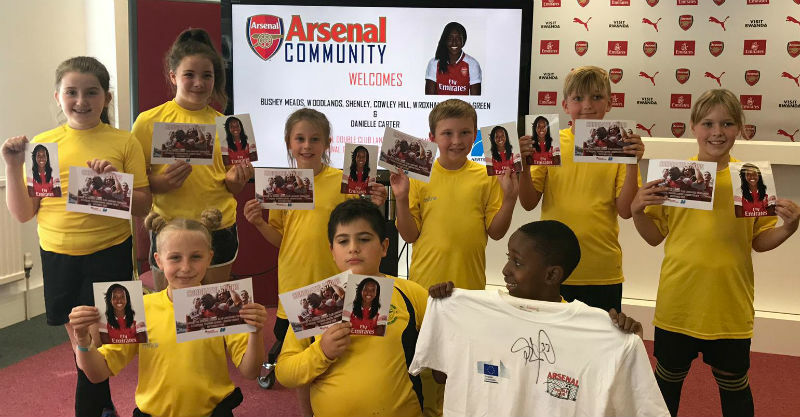 Arsenal Women & England striker, Danielle Carter, met all pupils at the end of the event to hold a Q&A and hand out prizes. Well done to all schools involved, especially our winners, Saffron Green, and our fantastic Ambassadors from Bushey Meads.